Major players in the male infertility treatment market comprise ZydusCadila Healthcare Limited, ASKA Pharmaceutical Co. Ltd, Intas Pharmaceuticals Ltd., Access Pharmaceuticals, Inc., Cordex Pharma, Inc., Pantarhei Bioscience B, Halotech DNA SL, Merck Serono, Andrology Solutions, and SCSA diagnostics. These players are set to bolster the growth of male infertility treatment market in the years to come. According to analysts at Zion Market Research, the global male infertility treatment market added up for USD 248.3 Million in 2016 and is likely to cross USD 334.6 by 2022, developing at a CAGR of almost 5.1% from 2017 to 2022. “Male infertility treatment market is boosted majorly by rising occurrence of male infertility cases all over the globe,” claim analysts at Zion Market Research. For example, as per WHO, one in every four couples in developing nations is likely to be impacted by infertility. In addition to this, the couples who are not able to bear a child fail to go for the costly therapy options for fulfilling their needs which result in development of male infertility treatment market. Moreover, increasing age, torpid lifestyle, and different psychological & environmental effects are the reasons that are directly accountable for elevating development of male infertility treatment market. On the other hand, discontinuation of treatment and emotional shock is the major restrainers that directly impact the development of male infertility treatment market. Nevertheless, continuous in-progress R&D and low-cost treatment in the healthcare industry are likely to open growth opportunities for the development male infertility treatment market over the forecast period. For instance, in June 2018, the BJU International study discovered that combination of CC (clomiphene citrate) and AZ (anastrozole) therapy shows potential in male infertility treatment, thereby boosting the male infertility treatment market. On the basis of techniques, the global male infertility treatment market is divided into 5 types such as sperm agglutination, oxidative stress analysis, DNA fragmentation, microscopic analysis, sperm penetration, and others. DNA fragmentation ruled the male infertility treatment market. The development of this method is credited to its highest accurateness followed by others. Region-wise, North America was the dominating area in 2016 for male infertility treatment market in terms of income owing to the accessibility of computer-guided technologically advanced screening tests. Moreover, lifestyle-associated factors such as stress, smoking, and obesity have become very common in European nations and the U.S., boosting the male infertility treatment market. 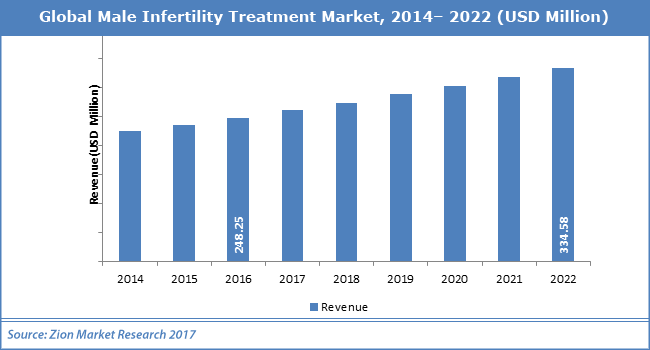 The male infertility treatment market has the huge growth avenues in emerging regions such as Latin America and Asia Pacific owing to the increased disposable income, public awareness, healthcare infrastructure, and government initiatives.